Beth Schultz talks with Mark Mohler about a buffalo wallow burrowed in the prairie. Arriving, we were welcomed by a large and lively black dog, a herd of cavorting, multi-colored cats, and a multitude of deer antlers decorating a limestone fence. We got out of the car to stretch and converse with the dog and cats and to take in the substantial Mohler home. Two-stories, also limestone, it was once the barn belonging to this 1860 homestead, the second oldest in Clay County. Mark, who, with his wife Deborah, had done the remodeling, informed us that, yes, all those antlers, in addition to the two pairs of immense elk antlers in his living room, he had found while walking his land. With Diesel, the dog, leading us, we set off to walk that land and to visit one of the most diverse of Kansas Land Trust easements. We came down a clipped grass slope behind the Mohler home and then went up again to peer into the small stone building, which was the first landowner’s home and which now housed a single tractor and possibly a family of barn owls. Unsurprisingly, the original barn, the basis for the homesteader’s livelihood, was far larger and grander than the original house. Scratched into one of the small home’s exterior walls, Aug. 9, 1876, the date a nephew had come to visit, was barely visible. We then visited nearby a small mill house, where a narrow brook gushed out of massive rocks and then calmed itself into a pond, before rushing headlong down a slope. Diesel paused for a drink. 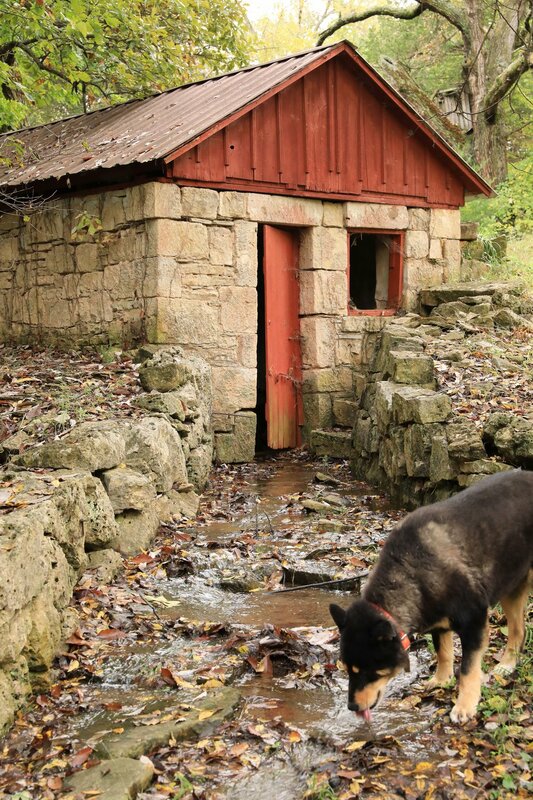 Diesel drinking from the brook running out of the spring house. Following the brook, we entered dense woods. Individual trees—white oaks, burr oaks, and chinquapins, bitternut hickory, Kentucky coffeetree, and wahoo, some of which dotted the slopes below the Mohler home—gathered together here. Tucking my trousers into my socks to discourage a late summer tick, I used the brook as my meandering path, following a sloshing Diesel. Sunlight streaking through the trees, we meandered our way forward. Catching up with my other companions, we paused to compare chinquapin and burr oak leaves and acorns. A barred owl, his sleep disturbed by our chatter, flew up in our faces and out in a flurry. We came out of the woods into full sun and an open wetlands. Welcoming us was a rafter of turkeys, primarily hens, who quickly hustled their way back into the woods. Here, where prairie began to merge with woodlands, Mark was working to generate this wetlands area in the interests of diversifying the land. At the same time, he was also attempting to eliminate the notoriously invasive Old World bluestem wherever he found it. I picked up a barred owl tail feather lying on top of the leaves to take home. Jerry Jost and Beth Schultz walking along a stream in the woods. Thanks to Bruce Hogle for the photograph. We walk now across the top of the prairie. It encompassed us, grasses rippling like muscles. Diesel sniffed at a low declivity in the land: an ancient buffalo wallow, explained Mark. A broad, green-leafed plant, apparent nowhere else on the prairie, has taken root here, indicating that the buffalo created an eco-system in this shallow basin, different from other parts of the grass land. I asked Mark about the native peoples who were here. He does not know who they were, but back at his home, before we departed, he showed us case after case of points he had found. He also brought out a petrified beaver’s tooth and a dinosaur tooth for us to ponder. This land Mark Mohler and his family care for now, this land where Diesel runs and which we have been privileged to visit, has been and will continue being home to an infinite number of living beings.